I like the look of the 1957 California. It backs up my theory that Ferrari made beautiful cars for years and then lost the plot for the last 30 before they had Pininfarina design the 468 Italia. 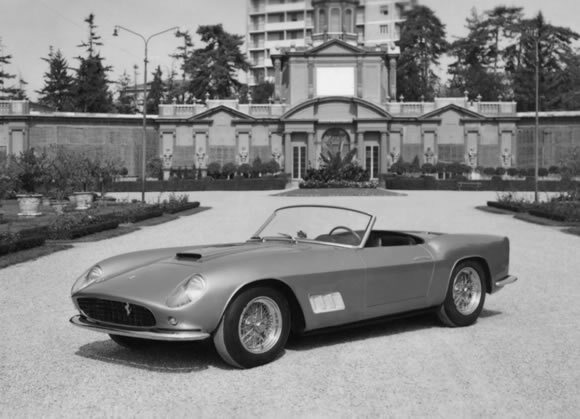 We have John Von Neumann, the California Ferrari represenative, to thank for the 250 California LWB. He felt sure there was a market for an open topped Berlinetta because of the great weather on the West Coast. Designed by Pininfarina, with the bodies built by Scaglietti in either aluminium or steel with aluminium doors, boot and bonnet, there were only 106 of these made. With a 240hp V12 and a top speed of almost 160mph it's great Ferrari chose to put disc brakes on the later cars. These Ferrari's are one of the most valuable cars on the planet fetching millions of dollars if and when they come up for sale. Beautiful cars from a great era and I think this it looks great in this setting. Let me know what you think of it on our Facebook page: http://facebook.com/ilovecars.